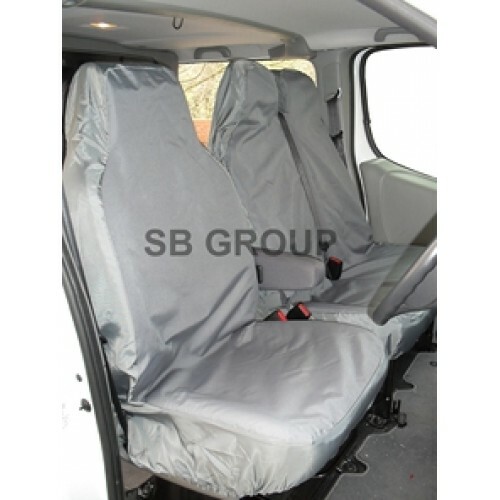 This set comprises of 1 single drivers seat cover, and matching double seat cover. 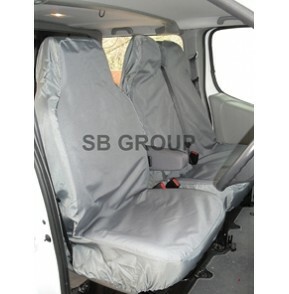 Our RENAULT TRAFFIC VAN seat cover is a tailored to fit product suited to fit this specification of van. Drivers Single: This is a complete seat cover that covers the front and the whole of the back of the seat. This seat cover has a velcro opening which will allow the armrest through and can than be resealed to its maximum position so that water, dust and dirt cannot penetrate through. 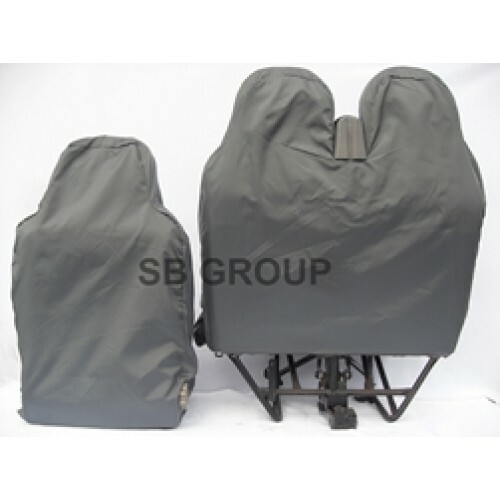 Passenger Double: A great feature of this double seat is that it has an aperture opening, so that the centre seat belt can be used by the passengers, all the seat belts driver and passenger side are functional and once again this particular is a full cover for the front and the back. Exterior Fabric: Heavy duty canvas polyester waterproof fabric. We are specialist in canvas waterproof because it is far superior to nylon (unfortunately we prefer not to use nylon as it tends to be slippy/uncomfortable and makes the customers back soggy and damp, hence our canvas waterproof fabric is far superior, more durable and robust and that’s why our main agent customers prefer it. Interior Fabric: Maximum protection of the seats is obtained by a pvc membrane which is coated to the underside of the canvas waterproof fabric. In other words there are two layers of fabric: exterior waterproof canvas with a full pvc lining. 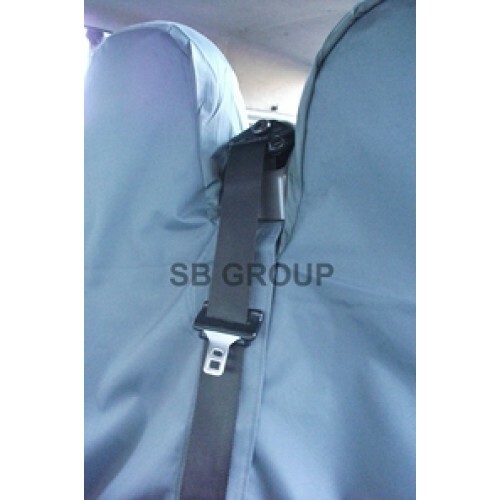 Backing Fabric: To maximize protection of the whole seat our seat cover covers the full back and here we have used a heavy gauge nylon material which is as a matter of interest fully wipe down. -We certainly recommend these truly classic waterproof seat covers if you are looking to protect your RENAULT TRAFFIC VAN seating so that this will improve the resell value of your vehicle for the future. Once fitted, you have the peace of mind that your seats will remain in a pristine condition. -If your seats are our worn out or it has patches of dirt or discoloration, disintegrated foam then we strongly recommend that you buy our van seat covers. -Ideal for: Builders, Electricians, Plasters, Construction companies, Florists, Couriers etc. For further details please feel free to email/telephone/arrange a visit. Please see our returns/refund policies in the terms and conditions. WE ARE THE SOLE MANUFACTURERS OF THIS SEAT COVER AND IF YOU REQUIRE CUSTOM MADE ITEMS, IE EXTRA DOUBLES / SINGLES PLEASE ASK. YOU ARE BUYING THIS DIRECT FROM OUR FACTORY HERE IN SOUTH MANCHESTER, UK. WE MAY HAVE USED A LIBRARY PHOTO TO ILLUSTRATE THIS PRODUCT....BUT WILL MOST CERTAINLY SEND THE CORRECT SIZE/ITEM TO YOU.